The pointer which can point or access whole the residence memory of RAM i.e. which can access all the 16 segments is known as huge pointer. 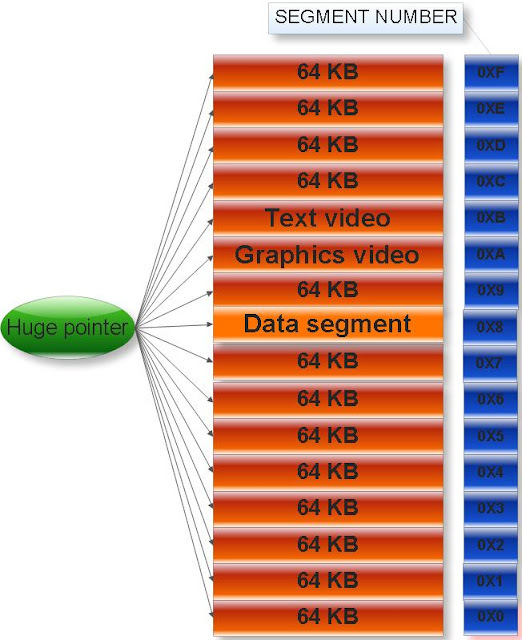 Size of huge pointer is 4 byte or 32 bit. Explanation: p is huge pointer, *p is far pointer and **p is char type data variable. Turbo C compiler is based on 8085 microprocessor in which physical address of memory is represented in 20 bit. Conversion of 4 byte or 32 bit huge address into 20 bit actual physical address is known as normalization. (q) What will be physical address of huge address 0X59994444? Note: Each hexadecimal digit is represented in 4 bit binary number. When any relation operation is performed between two huge pointers first it normalizes in actual physical address. Explanation: q is far pointer, p is near pointer, *p is double data type constant. If you will increment huge pointer it will increment both offset and segment address unlike to far pointer which only increments offset address. So if you have little knowledge about huge pointer and you are using huge pointer then you can easily access and modify the IVT, device driver memory, video memory etc. This might be dangerous for your computer. (q)Why there are three types of pointer in Turbo c compiler? Turbo c compiler is based on Dos operating system which is based on 8085 microprocessors. In 8085 microprocessor actual physical address is represented in 20 bit. But there are not any pointers which can point 20 bit address. Considering simplicity of calculations, access to actual physical address, security etc. c has introduced three type of pointer i.e. near, far and huge pointer. can anyone explain near, far pointers in short? your blog is great and i learned quite a lot..but one thing i would suggest that in 8085 MP physical address is of 16 bits. in 8086 MP the physical address is of 20 bits..
huge pointer and far pointer are one and the same? ?